Of the electrical companies serving homeowners in the Wayland, Massachusetts, area, few can match the combination of experience and customer-focused service offered by VMA Electric. We’ve been a trusted choice for residential and commercial customers since 2008, in part because we can handle any type of job, large or small, though custom installations are our specialty. Our electricians average more than a decade of experience and stay current on the industry’s best practices, so they have the expertise needed to ensure your project is done right the first time. What’s more, we’re proud to have maintained an A+ rating with the Better Business Bureau for many years, and we back our work with a one-year guarantee to give our customers added peace of mind. Another reason that residential and commercial clients choose VMA Electric instead of other electrical companies is the wide range of projects we can take on. 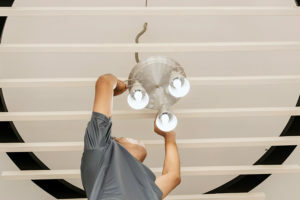 We routinely install home automation, security, and home entertainment systems, as well as custom indoor and outdoor lighting, smoke alarms, and backup generators. We can also provide general repairs, electrical panel upgrades, phone and data wiring, and new construction wiring, and we’re available for certified electrical inspections if one is needed during a home sale or purchase. Don’t waste time and money on electrical companies that overpromise and under-deliver. Contact VMA Electric today and let us demonstrate why homeowners throughout the Wayland, MA, area trust us with their electrical needs.